Over this last week I have had a wonderful time playing with colours for my second Bowland for the Bowland KAL. 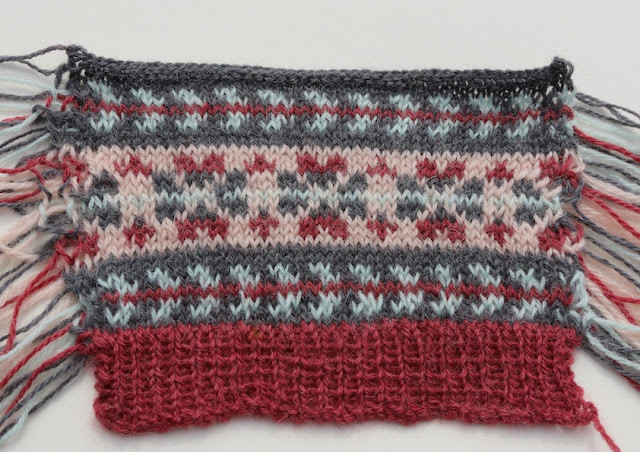 I regularly get asked how I choose colours for a Fair Isle knit and I have found the only sure fire way of being certain of your chosen colours is to knit swatches. 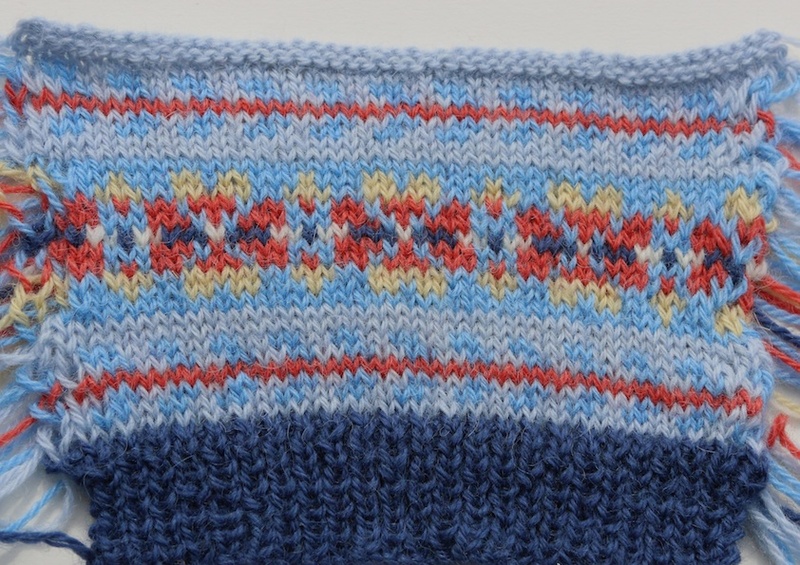 I usually knit at least two peerie (small motif) repeat and one main motif to really see how all the colours balance over the whole design. 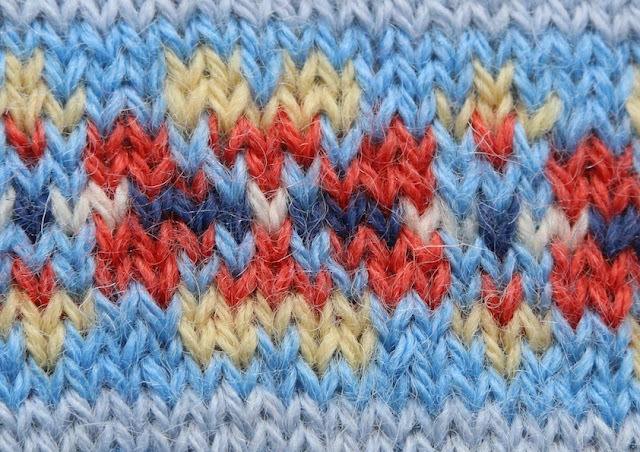 If there is going to be a welt I would always include a few rows of the welt colour in the swatch at the beginning again to be sure of seeing the balance over all. 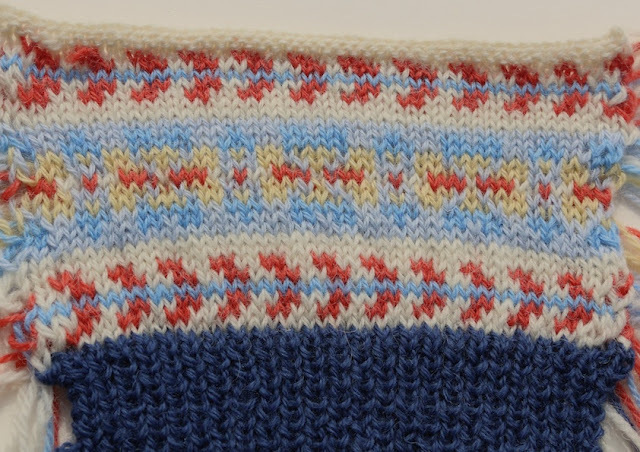 I begin by charting out a single repeat of the pattern - in this case the 12 stitch repeat of the main motif and 3 repeats of the 4 stitch peerie and then begin to experiment with colour combinations. I initially tried to apply the same colour combination rules as I had applied on the original Bowland design on all the swatches - The welt and button band colour would only be used again on the centre row of the main motif; the colour used for the 'arrows' on the peerie motif would only be used again on the centre row and the centre row of the peerie would be used for the inner petal rows on the main motif and finally lighter colour backgrounds and stronger colours for the pattern. However rules are sometimes made to be broken and I found I could create some very interesting combinations that were very different to the original if I broke some of these self imposed rules. I usually cast on the equivalent of 4 repeats - so in this case 48 sts on a circular needle. I work the welt back and forth and then when working the colour work sections I knit to the end of the row then draw the knitting back towards the right hand needle point and carry any required yarn across the back of the work leaving a long length and knit the next row - again on the RS of the work. I introduce any new colours simply by starting to knit with them. I leave lengths that are at least the width of the swatch itself and then when the swatch is cast off, I just cut the stranded lengths in half at the back of the work. Lets have a look at some of my colour swatches. All the swatch are knitting using my Excelana 4 ply - used for the original Bowland, and perfect for colour work. 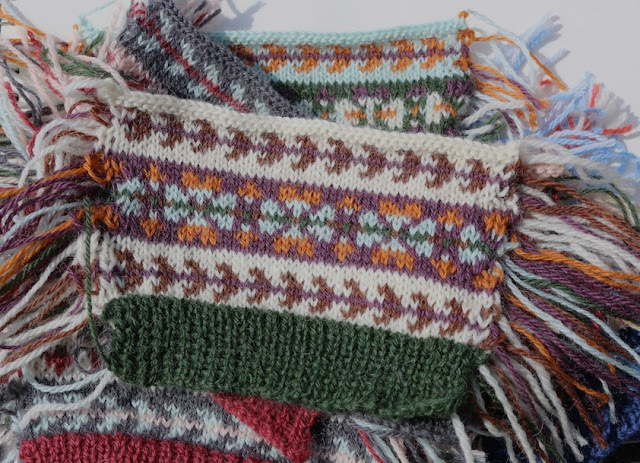 I knitted three swatches from a combination of the following 6 colours - Nile Green, Land Army Green, Ruby Red, Persian Grey, French Rose and Alabaster to create an 'Art Deco' colourway. 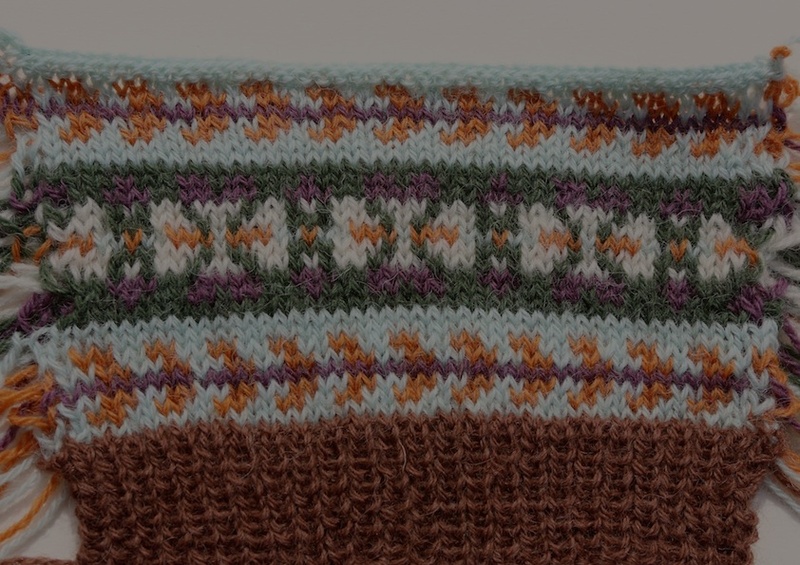 I particularly like the softness yet depth of this swatch. Using the French Rose and the Nile Green as the background colours has created quite a cool feeling palette. 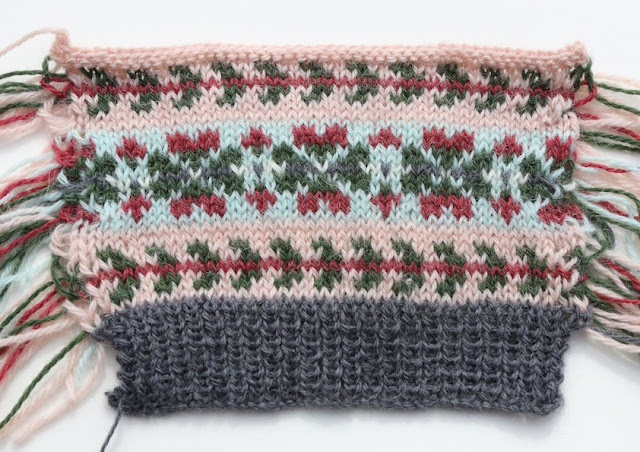 This swatch again only uses the same 5 colours as Deco 2 but by using Alabaster as the background colour to the main motif and softening the peerie by using French Rose as the centre row, this swatch has a very different feel to Deco 2. The next selection I worked with was using the original colours from my design. These are Sweet Chestnut, Alabaster, Dark Mandarin, Land Army Green, Damson Wine and Nile Green. 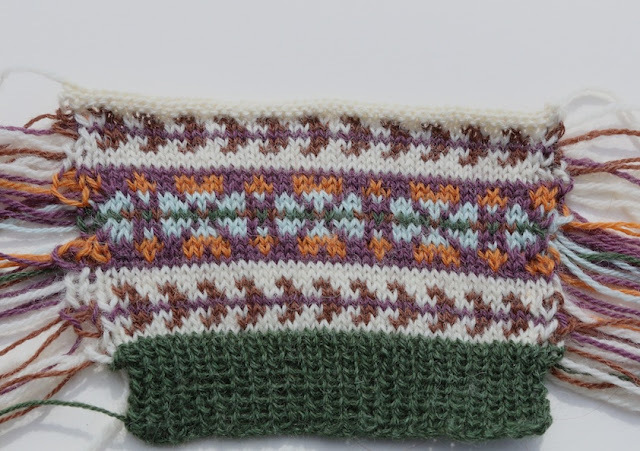 I tried with this first swatch to switch the colours in the main body around whilst leaving the welt in Sweet Chestnut. However I don't feel that this swatch works very well as the flower motif worked in Damson Wine is lost in the Land Army background. Likewise the centre row of the main motif using Dark Mandarin and Nile Green doesn't show up against the Alabaster as much as I would like. Interestingly on screen, using my charting programme, this colourway looked very striking and it was only as I knitted it that I could see that it really didn't work. This swatch works far better I feel. I have changed the welt to Land Army Green and changed around all the other colours to create a much more balanced arrangement. If I were to use this selection I think I would change the Damson Wine at the centre of the peerie to Nile Green just to make the peerie pattern pop a little more. I love this close up which really shows how the colours blend together. 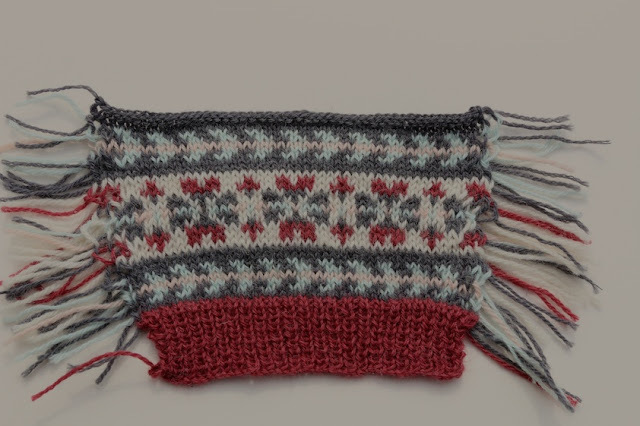 You can also see on this image the small fibres which cling together in a 'sticky' wool which in turn makes steeking a much easier process than many people imagine, as well as holding stitches together giving a much neater finished surface to your Fair Isle knitting. And now for two very special swatches using three incredibly limited edition colours of Excelana 4 ply. In fact at this point, I only have around 20 skeins of each of the three colours. These three colours have enabled me to create what I think of as a true 'vintage' palette. Here we have Vintage colourway 1, featuring a Coral Red, a Bright Blue and a pale Sky Blue as well as Powdered Egg, Alabaster and Cornflower Blue. 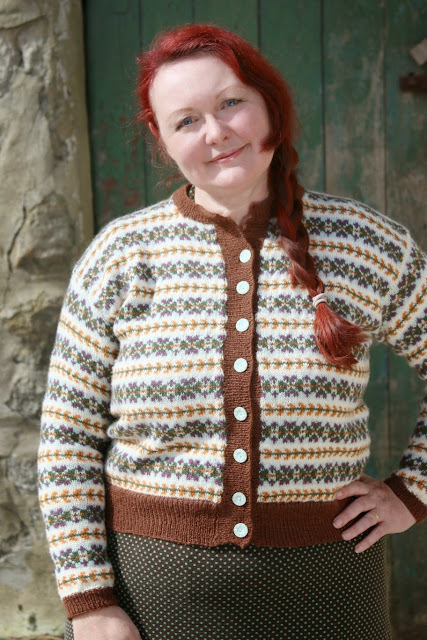 I am desperate for a blue based Fair Isle cardigan in my wardrobe and these two new shades really take the palette in a very different direction. This second colourway is almost my absolute favourite, using the two blues to great effect, whilst minimising the use of Alabaster thus creating a more tonal effect. The flowers on the main motif however, really come alive using Powdered Egg and the Coral Red against the Bright Blue. The Cornflower Blue used for the welt is used sparingly at the centre of the main motif as per my original rules and has a really powerful impact as a result. 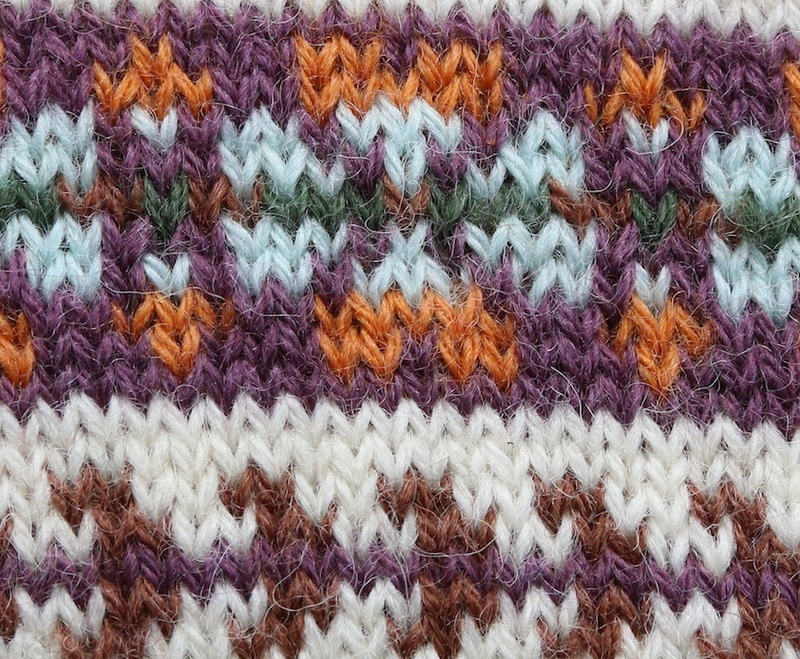 I'm thinking that this swatch might be the one but I'm very tempted to try one more swatch where the arrows of the peerie are knitted in Alabaster rather than Bright Blue and I just might have created the perfect colour palette for my next Bowland accidentally using all the rules I imposed on myself for the original design! What do you all think? What colour way do you like best? What changes would you make and do you have any colour combining tips for us? This new colourway will be available as an extremely limited edition kit from Friday 19th June at 9am (BST). The Deco colourway kit will also be available to purchase at that point aswell. Don't forget you can join in the Bowland KAL at any time. Simply purchase your Bowland pattern either from my website or via ravelry and join in the fun and discussion on my ravelry group. If you want to see all of the Excelana colours 'up close and personal' (other than the three super limited shades) both Williams Wools in Kendal and Knit with Attitude in Stoke Newington have all 12 colours available.